To ensure survival in a variety of environments, mammalian cells have evolved mechanisms to respond to decreased oxygen availability (hypoxia) and restore oxygen homeostasis. These adaptive mechanisms are called upon when blood flow to tissues is impaired, as occurs after vascular injury, or when metabolic demands on a cell are excessive, as occurs during increased mitotic activity. The hypoxic response involves enhanced expression of genes that promote new blood vessel formation (vasculogenesis), expansion of existing vasculature (angiogenesis), and that allow for anaerobic glycolysis. Key mediators of the altered gene expression are the hypoxia inducible factors (HIF), which are heterodimeric proteins of the bHLH-PAS family of transcription factors (1). Under hypoxic stress, HIF heterodimers bind to cis-acting regulatory elements in the promoter region of the target genes (hypoxia responsive elements [HRE]), and activate gene expression (2). The HIF-1 heterodimer consists of HIF-1α and HIF-1β (ARNT) (3), whereas HIF-2 contains HIF-2α (EPAS1, HLF, HRF, MOP2) and HIF-1β (4). HIF bioactivities are regulated by stability of the α subunits, which act as direct sensors of intracellular oxygen concentrations. When oxygen levels are sufficient to meet cellular demand (normoxia), HIFα subunits are subjected to an oxygen-dependent prolyl hydroxylation, which promotes an interaction with Von Hipple Lindau protein (VHL), an E3 ubiquitin ligase (5). Ubiquitinated HIF-α is then rapidly destroyed by 26S proteasomes (6). Conversely, when oxygen levels are insufficient (hypoxia), prolyl hydroxylation and subsequent HIF-α destruction are avoided (5). Remarkably, an oxygen-dependent hydroxylation reaction also controls the transactivation properties of HIF-1α. In normoxia, a conserved asparagine residue within the HIF-1α C-terminal transactivation domain, is hydroxylated, which blocks the recruitment of p300/CBP transcriptional co-activator. In hypoxia, asparagine hydroxylation is blocked and HIF-1α is free to engage p300 and initiate transcription (7). Disturbance of oxygen homeostasis and abnormal HIF activity contribute to the pathogenesis of a number of disorders, including heart and chronic obstructive pulmonary diseases, preeclampsia, and many types of cancer (for reviews, see references 8 and 9). HIF function during embryogenesis, however, has yet to be examined in detail. Nevertheless, the vascular abnormalities and embryonic lethality observed in mice with targeted disruption of the HIF-1α (10,11 ⇓), HIF-2α (12,13 ⇓), and HIF-1β (14) genes suggest that adaptation to environmental hypoxia, including induction of HIF, is crucial for normal vascular development. That hypoxia exists in developing embryonic tissues has been confirmed by studies with the hypoxia marker pimonidazole and its monoclonal antibody (15). The hypoxia marker is detected in areas where cells are undergoing high rates of proliferation and in tissues with incomplete or developing vascular networks, including the developing kidney (15). Among the genes strongly induced by HIF and highly expressed during kidney microvascular development is vascular endothelial growth factor (VEGF) (16,17 ⇓), a potent endothelial mitogen and chemoattractant required for normal embryonic angiogenesis and vasculogenesis (18,19 ⇓). Both VEGF tyrosine kinase receptors, Flk1 and Flt1, are also essential for proper vascular development, although they play different roles. Mice with targeted Flk1 mutations lack mature endothelial cells and do not undergo vasculogenesis (20), whereas Flt1 mutants contain mature endothelial cells but have malformed blood vessels (21). Tie-1 and Tie-2 receptor tyrosine kinases, which promote endothelial cell survival and branching morphogenesis, are also required for vascular development (22). The Tie-2 ligand, angiopoietin-1 (Ang-1), induces tyrosine phosphorylation of the receptor (23), whereas angiopoietin-2 (Ang-2) acts as an antagonist to Tie-2 activation (24). Concurrent Ang-2 and VEGF signaling hinders blood vessel stabilization and promotes vessel branching (25), whereas Ang-2 signaling in the absence of VEGF results in vessel regression (24). Activators of Tie-1 have not yet been identified. VEGF, Flk1, and Flt1 are all expressed during kidney organogenesis. VEGF production localizes primarily to podocytes, distal tubules, and collecting ducts (26,27,28 ⇓ ⇓), and Flk1 and Flt1 have been detected in endothelial cells of glomeruli and other renal blood vessels (26,27,29 ⇓ ⇓). By analyses of mice expressing β-galactosidase under control of the Flk1 promoter, cells expressing Flk-1 can be seen migrating into the vascular cleft of comma and S-shaped glomeruli (30). Interference of VEGF activity in newborn mice by administration of anti-VEGF antibodies or soluble VEGF receptor, mFlt(1–3)-IgG, results in smaller kidneys and increased numbers of avascular glomeruli (27,31 ⇓). The 5′ flanking promoter region of the VEGF and Flt1 genes contain the consensus HRE (5′-CGTG-3′), and HIF have been shown to induce VEGF and Flt1 mRNA and protein in vivo and in vitro in hypoxic conditions (16,17,32 ⇓ ⇓). Flk1 expression has also been shown to be induced in hypoxia by HIF-2 (33). Furthermore, metanephric organ culture experiments show that hypoxic induction of VEGF activity is important for kidney endothelial cell differentiation. Embryonic rat kidney explants grown in hypoxic culture conditions (3% oxygen) develop endothelial cells, a process that is inhibited by anti-VEGF antibodies (34). Normoxic cultures do not develop endothelial cells unless grown in media supplemented with VEGF. Endothelial cells that contribute to glomerular capillaries also express Tie-1, and organ cultured kidneys from Tie1/LacZ mice sustain endothelial development if grown in hypoxic conditions but not in normoxia (35). Tie-2–expressing endothelial cells are also found in capillaries in developing kidney cortex, including glomeruli (36), and Ang-2 is expressed in large renal blood vessels, maturing tubules, and mesangial cells of developing kidney (37). Hypoxia stimulates production of Ang-2 mRNA and protein in cultured mesangial cells (38). Taken together, these data suggest that hypoxia-driven gene expression plays a prominent role in development of the renal vasculature in organ-cultured metanephroi. Because the nephrogenic cortex of developing kidneys in situ is undergoing initial vascular assembly and cells are rapidly dividing (39), this area might also be experiencing transient hypoxia in vivo. We hypothesized that the compacted cells within the developing nephrons, including podocytes, are especially susceptible to microenvironmental hypoxia. Such oxygen gradients and localized regions of hypoxia might stabilize HIF, which then stimulate transcription of VEGF and other factors required for kidney development. To explore this possibility, we examined developing mouse kidneys for the expression of HIF-1α, HIF-2α, and HIF-1β and found HIF mRNA and protein distribution to coincide with sites of VEGF production. We also discovered that hypoxia induced HIF-1α and HIF-2α protein stabilization as well as VEGF mRNA expression by embryonic kidneys in vitro. Primers for HIF-1α and HIF-1β RT-PCR were designed from the mouse mRNA sequences: HIF-1α (accession number, NM 010431) forward primer 5′-AGCCCTAGATGGCTTTGTGA-3′ and reverse primer 5′-TATCGAGGCTGTGTCGACTG-3′; HIF-1β (accession number XM 131029) forward primer 5′-CAGAGGGCTATTAAGCGACG-3′ and reverse primer 5′-ATACAGTGTGCTCCCGAACC-3′. Primers for HIF-2α RT-PCR were as described previously (12): HIF-2α forward primer 5′-AATGACAGCTGACAAGGAGAAAAA-3′ and reverse primer 5′-GAGTGAAGTCAAAGATGCTGTGTC–3′. Total RNA was isolated from embryonic day 14, and newborn wild-type CD-1 mice with the RNAwiz reagent (Ambion, Inc., Austin, TX) according to the manufacturer’s protocol. One-microgram RNA aliquots underwent reverse transcription for 45 min at 48°C followed by 45 rounds of PCR under the following conditions: 30-s denaturing at 94°C, 1-min primer annealing at 60°C, and 2-min primer extension at 68°C with a final extension period of 7 min. RT-PCR products were electrophoresed through a 1% agarose gel and visualized with ethidium bromide. Bands containing the cDNA were excised from the gel, inserted into the TOPO-pCR2.1 vector (Invitrogen Corp., Carlsbad, CA), and cloned according to the TOPO cloning procedure. The cDNAs were sequenced by the University of Kansas Medical Center Biotechnology Core Facility. Sense and antisense probes for Northern blots and in situ hybridization experiments were transcribed from the HIF-1α and HIF-2α cDNAs generated by RT-PCR. First, cDNAs were purified from 1% agarose gels and ligated into the pGEM-T Easy vector (Promega Corp., Madison, WI), which provides flanking SP6 and T7 RNA polymerase promoters. Riboprobes were then transcribed and biotinylated with reagents from the Maxiscript and BrightStar Psoralen-Biotin kits (Ambion). Briefly, plasmids for SP6 RNA polymerase transcription (sense probe) were linearized by digestion with NcoI and those for T7 transcription were linearized with SacI. The DNA templates were incubated with the appropriate RNA polymerase and NTP for 1 h at 37°C. After ethanol precipitation, purified RNA products were crosslinked to the Psoralen-Biotin reagent by UV irradiation. Poly A+ mRNA was isolated from newborn mouse kidney total RNA, and aliquots (1 μg) were resolved on a 1% agarose-formaldehyde gel, transferred to a nylon membrane by capillary action, and UV cross-linked. Nylon membranes were incubated in UltraHyb buffer (Ambion) containing sense or antisense probe (0.1 nM) for 16 h at 71°C. After hybridization, membranes were washed for 30 min in blocking buffer, followed by a 30-min wash in blocking buffer containing Streptavidin-alkaline phosphatase (0.1 μg/ml), three 15-min washes in wash buffer, and two 2-min washes in assay buffer. The CDP-Star chemiluminescence reagent was applied for 5 min, and the membranes were exposed to film. Blocking, wash, and assay buffers were purchased from Ambion. Newborn kidney sections were fixed overnight in 10% formalin, dehydrated, and embedded in paraffin. All reagents and buffers for in situ hybridization were purchased from Ambion. Five-micron-thick sections were covered with proteinase K (20 μg/ml in 0.05 M Tris, pH 7.5) and incubated for 30 min at 37°C. After three 5-min washes in 0.05 M Tris, blocking buffer (100 mM Tris/100 mM NaCl, 1% BSA) was applied to sections for 30 min at 37°C. Sense and antisense probes were diluted in hybridization buffer (0.1 nM) and hybridized to sections for 3 h at 65°C. Two 10-min washes in 2× wash buffer and two 5-min washes in 1× wash buffer cleared the slides of unhybridized probe. Streptavidin-alkaline phosphatase conjugate, diluted 1:1000 in 0.05 M Tris, was incubated on slides at 37°C for 30 min, and after three 5-min washes in 1× Tris, was detected by addition of NBT/BCIP solution at 37°C. Color development was monitored closely and terminated by immersing slides in dH2O. Newborn mouse kidneys were Dounce homogenized in RIPA buffer (50 mM Tris, pH 8.0, 150 mM NaCl, 1.0% Triton X-100, 0.5% sodium deoxycholate, 0.1% SDS; 3 μl/mg tissue), supplemented with protease inhibitors (10 μg/ml PMSF, 30 μl/ml aprotinin, 10 μ/ml sodium orthovanidate [1 M], 2 μg/ml pepstatin A, 2 μg/ml leupeptin, and 2 μg/ml antipain), and incubated on ice for 15 min. Cellular debris was pelleted by centrifugation at 15,000 × g for 25 min at 4°C, and the supernatant was cleared by incubation with protein A agarose (Santa Cruz Biotechnology, Inc., Santa Cruz, CA) (1 μl/10μl lysate) for 15 min on ice and a final centrifugation at 15,000 × g for 5 min at 4°C. Monoclonal HIF-1α, polyclonal HIF-2α, or HIF-1β (all from Novus Biologicals, Littleton, CO) were added to the lysates (1 μg/100 μl lysate) and incubated on ice for 1 h. Protein A agarose (1 μg/10 μl lysate) was added to the reaction and incubated with shaking for 1 h at 4°C. The agarose was pelleted by centrifugation at 10,000 × g for 30 s at 4°C, washed four times with ice-cold RIPA buffer, and resuspended in 1× reducing SDS-sample buffer. The immunoprecipitated proteins were resolved by 7.5% SDS-PAGE, transferred to nitrocellulose, and blocked in 5% nonfat dried milk, 0.1% Tween-20 in PBS. Blots were incubated in primary antibody (1:100) overnight, diluted in blocking buffer, at 4°C. After washes in blocking buffer, blots were incubated in HRP-conjugated secondary antibodies (diluted 1:1000 in blocking buffer) for 1 h at room temperature. Membranes were washed in three changes of 0.1% Tween-20 in PBS, and the bands were visualized by ECL (Amersham Pharmacia Biotech, Piscataway, NJ). Biotinylated broad-range molecular weight markers (Bio-Rad Laboratories, Hercules, CA) were resolved in the gels to size the proteins. For HIF-1β immunohistochemistry, newborn kidneys were frozen immediately after dissection in OCT in isopentane chilled in a dry-ice/acetone bath. Sections (6-μm-thick) were fixed in 100% methanol on ice. For HIF-2α, anesthetized newborn mice were perfused through the right ventricle with PBS followed by 4% paraformaldehyde. Kidneys were dissected immediately and fixed in 4% paraformaldehyde for 2 h on ice, embedded in paraffin, and sectioned at 6 μm. Sections were quenched for endogenous peroxidase activities by incubating slides in 3% H2O2 in methanol for 15 min. Nonspecific protein interactions were blocked by applying 10% normal goat serum in PBS. HIF-1β and HIF-2α rabbit polyclonal antibodies (Novus Biologicals) were diluted 1:100 in PBS and incubated on sections for 1 h at room temperature. After three washes in ice-cold PBS, sections were treated with secondary biotinylated anti-rabbit antibodies (15 μg/ml) for 30 min at room temperature and then with streptavidin-HRP conjugate for another 30 min at room temperature. Slides were color developed with DAB. Control experiments were performed with nonspecific rabbit IgG in place of the primary antibody. Pimonidazole hydrochloride (Hypoxyprobe-1; Chemicon International Inc., Temucula, CA) was injected intraperitoneally into newborn mice (200 mg/kg). One hour after injection, kidneys were dissected and immediately frozen in OCT in isopentane in an acetone/dry-ice bath. Cryostat sections were cut at a thickness of 6 μm and fixed in ice-cold methanol. Sections were blocked in 10% goat serum for 30 min at room temperature and then incubated in Hypoxyprobe-1 monoclonal antibody (1:50) for 1 h. After three washes in PBS, fluorescein-conjugated goat anti-mouse antibodies (1:1000) were applied for 1 h. Sections were then permanently mounted using the Prolong anti-fade reagent (Molecular Probes Inc., Eugene, OR). Control experiments were performed by injecting saline in place of Hypoxyprobe-1, and kidney sections were labeled exactly as described above. Results shown are representative from injections of Hypoxyprobe-1 or saline into multiple newborns from five separate litters born during a several-month period. Additionally, four mature mice received injections of Hypoxyprobe-1, two received saline, and kidney tissues were processed as described. Embryos were extracted from timed-pregnant female mice at embryonic day 12 (E12). Metanephroi were dissected and transferred to transparent PET membrane cell culture inserts (0.4-μm pore size; BD Biosciences, San Jose, CA) in a six-well culture plate. Approximately 1 ml of organ culture media (Dulbecco modified Eagle medium supplemented with 10% calf serum, 50 μg/ml L-glutamine, 1% Matrigel [BD Biosciences], 50 U/ml penicillin, and 50 μg/ml streptomycin) was added to the lower chamber of each well. Cultures were maintained at 37°C in a humidified chamber containing 5% CO2 and 95% air (approximately 20% O2). For hypoxic cultures, nitrogen was used to displace air until O2 concentration was either 2% or 5%. Two sets of experiments were performed: one in which E12 kidneys were maintained at either 20% or 5% O2 for 5 d, and another in which kidneys were cultured for 5 d at 20% O2 and then moved to an atmosphere of 2% O2 for 6 h. After incubations, separate kidneys (three per experimental condition) were vortexed for approximately 1 min in 1 ml of Trizol (Invitrogen Corp.). RNA and protein were isolated from each kidney as described in the manufacturer’s protocol. Briefly, after addition of chloroform to Trizol, RNA was precipitated from aqueous phase and protein from the organic phase with isopropanol. RNA and protein concentrations were determined spectrophotometrically and with a Modified Lowry Assay, respectively. Equal amounts of protein from each condition were resolved by 7.5% SDS-PAGE (20 to 50 μg, depending on total protein yield) and transferred to nitrocellulose. Western blots were performed as described previously, and total band densities were measured using an NIH Image (V1.61) program. VEGF mRNA concentrations were measured using the Quantikine mRNA colorimetric quantification kit (R&D Systems, Minneapolis, MN) according to manufacturer’s protocol. Total RNA samples (1 μg) were hybridized for 1 h in a 65°C water bath to two oligonucleotide probes: a biotinylated VEGF capture probe and a digoxigenin-labeled detection probe. This solution was then transferred to a streptavidin-coated microplate and incubated for 1 h at room temperature to immobilize the VEGF mRNA. After clearing the wells of unbound nonspecific RNAs by washing, polyclonal anti-digoxigenin alkaline phosphatase–conjugated antibodies were added to wells for 1 h. Substrate solution and amplifier were added for color development. Color intensity, which was proportional to the amount of VEGF mRNA captured, was by measured by reading the absorbance at 490 nm. A standard curve was generated for each experiment after manufacturer’s procedures to determine VEGF mRNA concentrations in organ culture samples. We detected renal HIF expression by RT-PCR on RNA extracted from mouse kidneys at embryonic day 14 (E14) and on the day of birth (Nb) using primers specific for HIF-1α, HIF-2α, and HIF-1β. In each case, we obtained a cDNA of the predicted size (467 bp, 407 bp, and 519 bp, respectively) (Figure 1a). The nucleotide sequences of the RT-PCR products were found to be identical to those reported for each transcript. By Northern blot analysis, newborn mouse kidneys contained two transcripts for HIF-1α (approximately 4.5 and 5.5 kb) and HIF-2α (approximately 5.0 and 6.2kb) (Figure 1b). Figure 1. Analysis of hypoxia-inducible factor (HIF)–1α, HIF-2α, and HIF-1β mRNA expression in developing kidneys by RT-PCR and Northern blot analyses. (a) Total RNA isolated from E14 and newborn (Nb) mouse kidneys were analyzed for the presence of HIF transcripts by RT-PCR with primers specific for HIF-1α, HIF-2α, and HIF-1β. The predicted size of each PCR product, 467 bp, 407bp, and 519 bp, respectively, was obtained. The bands were isolated, cloned, and sequenced to ensure specificity. Control experiments performed in the absence of the reverse transcriptase (RT) enzyme are negative. (b) One-microgram aliquots of poly A+ mRNA isolated from Nb mouse kidneys were resolved on an agarose-formaldehyde gel, transferred to nylon, and probed with biotinylated anti-sense RNA probes directed against HIF-1α and HIF-2α. Two bands were seen for HIF-1α (approximately 4.5 and 5.5 kb) and HIF-2α (approximately 5.0 and 6.2 kb). HIF-1α and HIF-2α mRNA were localized in newborn mouse kidneys by non-isotopic in situ hybridization. The tissue distribution patterns were similar for both transcripts, with concentrated expression in the nephrogenic zone of the extreme outer cortex and diminished expression in the more mature, inner cortex (Figures 2a and 3a). Intense signals for both HIF-1α and HIF-2α mRNAs were detected in early nephric figures (Figures 2a and 3b) and particularly in podocytes of immature glomeruli (Figures 2c and 3c). Proximal convoluted tubules in the inner cortex generally showed weak expression of each transcript (Figures 2a, 3a, and 3b). In the medulla, collecting duct epithelia and interstitial cells were positive for both HIF-1α and HIF-2α (Figures 2b and 3d). Experiments performed with sense probes as controls were completely negative for both HIF-1α (Figure 2d) and HIF-2α (Figure 3e). Figure 2. Visualization of HIF-1α mRNA expression in Nb mouse kidney by non-isotopic in situ hybridization. (a) Survey of Nb mouse kidney cortex showing high expression of HIF-1α in most cells of the nephrogenic zone (brackets). Developing glomeruli (arrows) showed HIF-1α mRNA expression in podocytes. Proximal convoluted tubules (PCT) have weak or negative hybridization signals. (b) Nb mouse kidney medullarly collecting duct epithelia are positive for HIF-1α. (c) Higher power view of a maturing glomerulus with strong hybridization signals in podocytes (arrows). (d) Hybridization experiments with sense-probes as controls are negative. Figure 3. Visualization of HIF-2α mRNA expression in Nb mouse kidneys by in situ hybridization. (a) Low-power view of a Nb mouse kidney cortex demonstrating highest expression of HIF-2α mRNA in the nephrogenic zone (brackets), similar to HIF-1α. In glomeruli (arrows), podocytes are expressing HIF-2α mRNA. Positive hybridization signals are also found in tubules and interstitial cells. (b) Developing nephrons (double arrows) in the nephrogenic zone show high expression of HIF-2α mRNA. PCT are weak or negative for signal. (c) Higher power view of maturing stage glomeruli. Podocytes (arrows) show strong hybridization signals. (d) View of medulla demonstrating HIF-2α mRNA expression in collecting ducts and interstitial cells. (e) Sections probed with sense-RNA show no hybridization. To test for the presence of heterodimeric HIF protein in developing kidneys, we carried out a series of immunoprecipitations and Western blot analyses. Proteins immunoprecipitated from newborn kidney lysates with HIF-1α antibodies were positive on Western blots for HIF-1β and HIF-1α (Figure 4), demonstrating the presence of HIF-1α/1β heterodimers. Similarly, Western blots of HIF-2α immunoprecipitates were positive for HIF-1β and HIF-2α (Figure 4), indicating the presence of intact HIF-2 in newborn kidney lysates. Further evidence for the presence of HIF-1 and HIF-2 came from experiments showing that proteins immunoprecipitated with HIF-1β antibodies were positive on Western blots for HIF-1β, HIF-1α, and HIF-2α (Figure 4). For controls, proteins immunoprecipitated with nonspecific rabbit IgG were probed on Western blots with HIF-1α, HIF-2α, and HIF-1β antibodies and were negative in each case (Figure 4). Figure 4. Evidence for formation of HIF-1 and HIF-2 heterodimers in developing kidneys. Immune complexes precipitated from Nb mouse kidney lysates with HIF-1α, HIF-2α, and HIF-1β antibodies were analyzed by Western blotting. HIF-1β and HIF-1α are detected on Western blots (WB) of proteins immunoprecipitated (IP) with anti-HIF-α antibodies, confirming presence of HIF-1 heterodimer in Nb mouse kidney. Likewise, positive bands for both HIF-1β and HIF-2α on WB of proteins immunoprecipitated with HIF-2α antibodies confirm presence of HIF-2. Immunoprecipitations performed with anti-HIF-1β are positive on WB for HIF-1β, HIF-1α, and HIF-2α. Control (Con) immunoprecipitations performed with non-specific IgG and blotted with HIF-1α, HIF-2α, or HIF-1β antibodies are negative. To localize HIF protein expression in newborn kidneys, we carried out immunohistochemistry using HIF-2α and HIF-1β antibodies. 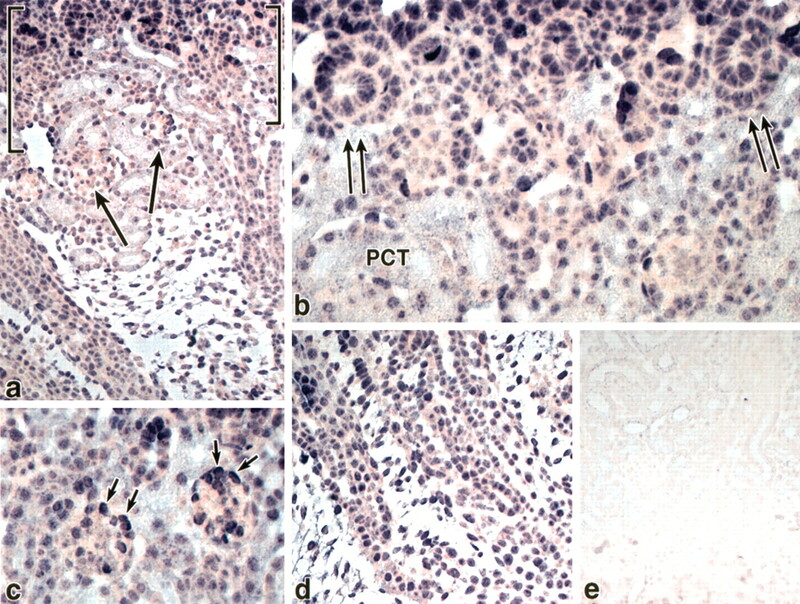 HIF-1β protein was widely expressed in newborn kidneys, and nuclear staining was seen in glomeruli and all tubular segments (Figure 5). On the other hand, HIF-2α was localized selectively to the nephrogenic zone of the outer cortex, where intense immunolabeling was detected primarily in nuclei of early nephric figures (Figure 6a). Many tubular segments of the cortex displayed a finely granular, cytoplasmic pattern for HIF-2α, in addition to nuclear staining (Figure 6a). Higher magnification views of developing nephrons showed strong nuclear localization of HIF-2α primarily in developing podocytes of comma-shaped and S-shaped figures (Figure 6b) as well as capillary loop stage glomeruli (Figure 6a). In maturing glomeruli located deeper in the cortex, podocyte nuclei were also positive for HIF-2α (Figure 6a). No staining was observed in control tissue labeled with nonspecific IgG (Figure 6c). We were not able to immunolocalize HIF-1α with the monoclonal antibody and histochemical techniques used here. Figure 5. Cryostat sections of Nb mouse kidney labeled with anti-HIF-1β and immunoperoxidase, as described in Materials and Methods. (a) Nuclear labeling for HIF-1β is seen in essentially all cells, including epithelium of nephric figures (arrows) and glomeruli. (b) Sections labeled with nonspecific IgG as controls are negative. Figure 6. Paraffin sections of Nb mouse kidney labeled with anti-HIF-2α (a and b) or nonspecific IgG (c) and processed for immunoperoxidase. 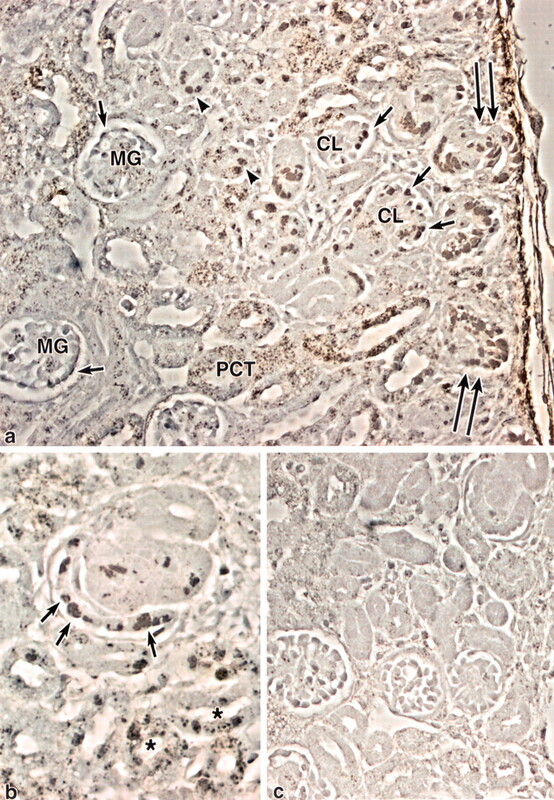 (a) Nuclear localization of HIF-2α is present in epithelial cells of nephric figures (double arrows) in the outer cortex, as well as in podocytes (single arrows) of capillary loop stage glomeruli (CL) and maturing glomeruli (MG). 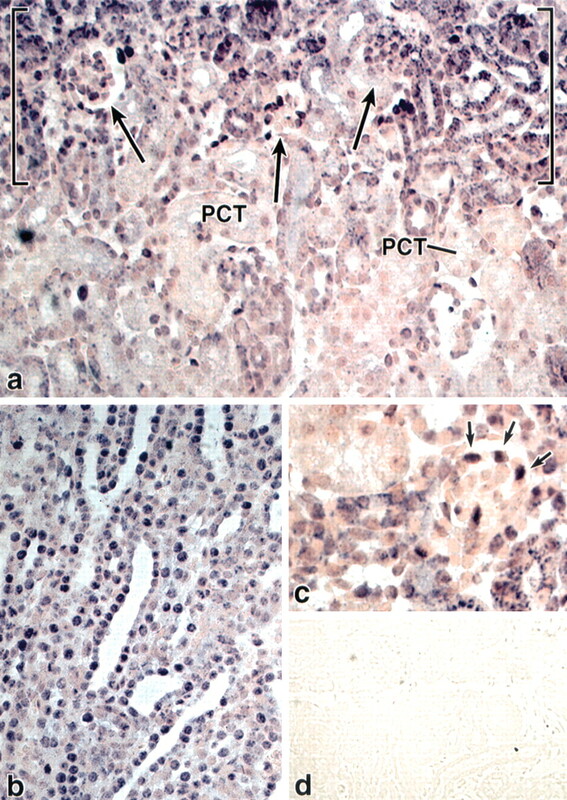 Granular cytoplasmic staining is sometimes found in proximal convoluted tubule epithelium (PCT) in addition to nuclear staining. Other developing tubular epithelial cells (arrowheads) show positive nuclear staining. (b) Higher-power view of developing nephrons shows specific nuclear localization of HIF-2α within developing podocytes cell layer (arrows). Nuclear and cytoplasmic staining can be seen in some tubular segments (*). (c) No immunoperoxidase labeling is found in control tissue incubated with nonspecific IgG. To scan morphologically for hypoxic regions in developing kidney, we injected the chemical hypoxia marker, pimonidazole hydrochloride (Hypoxyprobe-1), into newborn mice. Immunofluorescence microscopy showed Hypoxyprobe-1 binding in many developing and maturing tubules in the inner cortex (Figure 7a). Weak binding was also seen diffusely in the nephrogenic outer cortex (Figure 7a). In the medulla, Hypoxyprobe-1 immunofluorescence was observed in collecting duct epithelial cells (Figure 7b). No Hypoxyprobe-1 immunolabeling was seen in saline-injected newborn mice that served as controls (Figure 7c), and cortical areas of adults that received Hypoxyprobe-1 injections were also negative (Figure 7d). Figure 7. Identification of hypoxic cells in developing kidneys. Hypoxyprobe-1 was intraperitoneally injected into Nb mice (200 mg/kg) and allowed to circulate for 1 h. Hypoxyprobe-1 monoclonal antibody and fluorescein-conjugated secondary antibodies were used to detect the molecule, which is covalently linked to amino acid side chains of proteins only within severely hypoxic cells (pO2 ≤ 10 mmHg). (a) Overview of Nb kidney immunolabeled for Hypoxyprobe-1. Cells in the nephrogenic zone (*) appear diffusely but only weakly positive for Hypoxyprobe-1. Many developing and maturing tubules (arrows) show strong fluorescence. (b) High-power view of medulla shows Hypoxyprobe-1 immunofluorescence in collecting ducts. (c) Mice injected with saline as controls and processed for Hypoxyprobe-1 immunofluorescence are negative. (d) Section from cortex of adult mouse that received Hypoxyprobe-1 injection. No specific binding is observed. Fields shown in panels a, c, and d were all taken at the same magnification. Finally, we examined the effect of hypoxia, after both chronic and brief exposures, on HIF-α protein stability and VEGF mRNA transcription in metanephric organ culture. 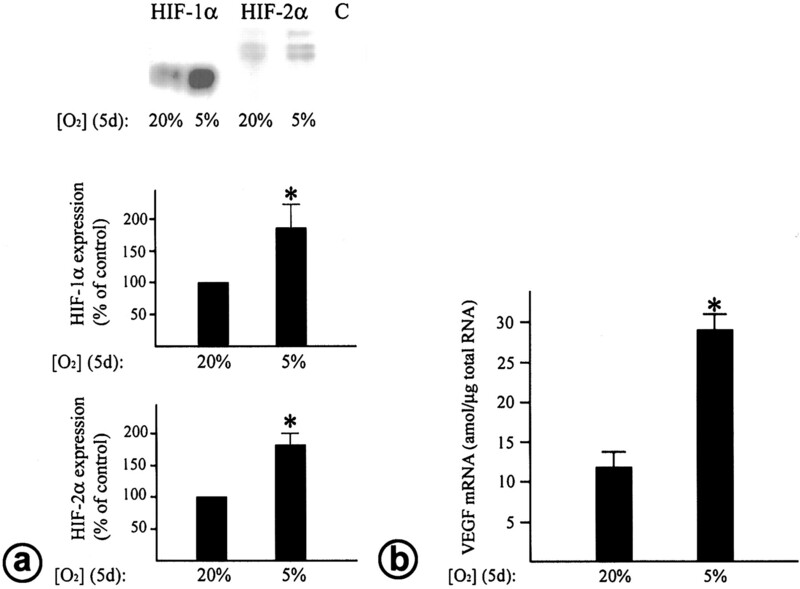 After 5 d in culture, E12 kidneys expressed HIF-1α and HIF-2α proteins and VEGF mRNA in the presence of 20% oxygen, but expression of each was significantly higher in cultures maintained at 5% oxygen (Figure 8, a and b). 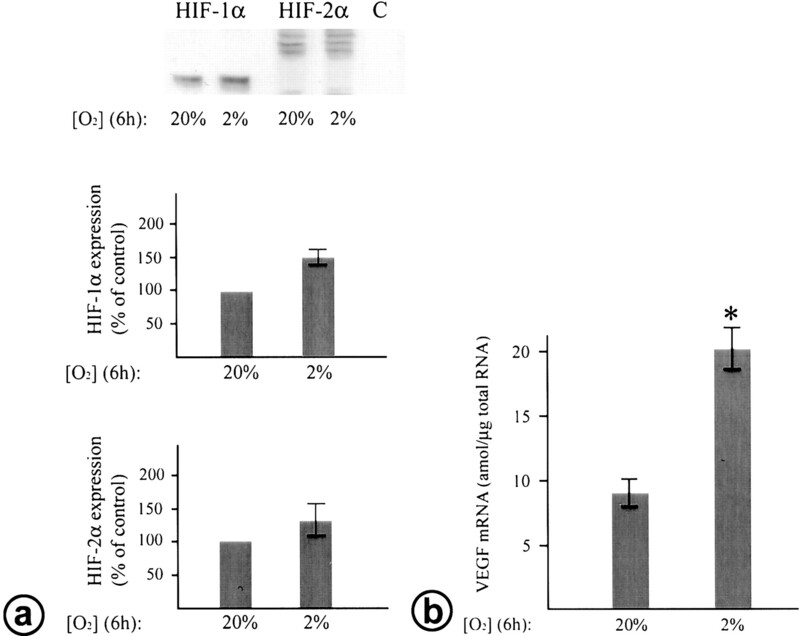 Similarly, organ-cultured kidneys contained higher levels of HIF-1α and HIF-2α proteins and VEGF mRNA when shifted from a normoxic to hypoxic environment (2% oxygen) for 6 h, when compared with those maintained at normoxia (Figure 9, a and b). Figure 8. HIF-1α and HIF-2α protein and vascular endothelial growth factor (VEGF) mRNA expression in embryonic mouse kidney explants exposed to chronic hypoxia. Embryonic kidneys were harvested at E12 and cultured for 5 d in normoxia (20% O2) or hypoxia (5% O2). (a) Total kidney proteins were collected from normoxic and hypoxic cultures, and equal amounts of protein from each sample were used for Western blots with anti-HIF-1α, HIF-2α, or control (C) antibodies as indicated. A representative blot from each experiment is shown in top panel. Histograms represent means of densitometry scans, ± standard error. * P<0.05 for kidneys grown at 5% versus kidneys grown in 20% oxygen (n = 3 for each condition). (b) Total RNA was isolated from cultures, and VEGF mRNA concentration was measured as described in Materials and Methods. Data are expressed as mean ± standard error (n = 3). * P<0.005 versus control kidneys grown in 20% oxygen. Figure 9. (a) HIF-1α and HIF-2α protein and VEGF mRNA expression in embryonic mouse kidney explants exposed to transient hypoxia. Embryonic kidneys were dissected at E12 and cultured for 5 d at normoxia (20% O2) and then exposed to hypoxia (2% O2) for 6 h. (a) After the incubations, total kidney proteins were isolated and equal amounts from each condition used for Western blots. A representative blot from each experiment is shown. Histograms show means of densitometry scans, ± standard error. (b) Total RNA was isolated from cultures, and VEGF mRNA concentration was measured as described. Data are expressed as mean ± standard error (n = 3 for each condition). * P<0.005 versus control kidneys grown in 20% oxygen. Establishment of the renal vascular system requires coordinated signaling events between growth factors and receptor tyrosine kinases, including the VEGF and Angiopoeitin-1 and Angiopoeitin-2 signaling cascades. VEGF, Flk-1, and Flt-1 genes contain hypoxia-responsive promoter elements (16,17,32,33 ⇓ ⇓ ⇓), and Ang-2 expression is induced in hypoxia (38). These observations lead us to hypothesize that hypoxia and HIF stabilization may play important roles in regulating expression of genes vital for kidney vascular development. Previous studies have shown that HIF-1α and HIF-2α mRNAs are expressed in mature human and mouse kidneys (40) and that 4 to 6-wk-old mouse kidneys express HIF-1α protein in normoxia that elevates in hypoxia (41). The expression patterns of HIF during kidney development, however, had not been examined in detail previously. The data presented here reveal that high levels of HIF mRNA and protein expression occur in developing cortex and medulla, especially in podocytes and collecting ducts, which are sites of robust VEGF production. Of these regions of HIF expression, however, only the medulla and inner cortex reacted strongly with Hypoxyprobe-1 and can therefore be considered to be severely hypoxic. Furthermore, our results show that HIF-1α and HIF-2α proteins are expressed in embryonic kidney organ cultures in normoxia, are further stimulated by hypoxia, and that VEGF mRNA levels also increase during hypoxic conditions. These findings suggest that HIF activation may stimulate production of VEGF in developing kidneys and that both hypoxia-dependent and -independent modes of HIF activation are probably occurring. Northern blot analyses of human tissues have revealed a message size of approximately 4.4 kb for HIF-1α and approximately 5.8 kb for HIF-2α mRNA (40). Our analysis of newborn mouse kidney RNA is in rough agreement with these data, but our blots also indicate that two transcripts were produced from both the HIF-1α and HIF-2α genes. The murine HIF-1α gene has previously been shown to be under the control of two distinct promoters, resulting in two mRNA products (42). One transcript is nearly ubiquitously expressed, but the other is tissue-specific and found primarily in kidney, tongue, stomach, and intestine (42). Here we report by Northern analyses the size of the two HIF-1α mRNA products in mouse kidneys to be approximately 4.5 and 5.5 kb. We also discovered two mRNA products for HIF-2α, approximately 5.0 and 6.2 kb, suggesting that the HIF-2α gene might be structurally similar to HIF-1α. The functions of the alternate HIF-α transcripts and factors regulating their expression have yet to be determined. To date, few studies have demonstrated HIF-α protein expression in normoxic or nondiseased tissues (41,43 ⇓). The mice used in our experiments were not undergoing experimentally imposed hypoxic stress, yet HIF-1α and HIF-2α proteins were readily detectable during normal kidney development. As determined by Western blotting, HIF-1β was co-immunoprecipitated from newborn kidney lysates with anti-HIF-1α and HIF-2α antibodies, demonstrating that both HIF-1 and HIF-2 heterodimers were present. HIF-1β antibodies also pulled down both α subunits from kidney lysates, providing further evidence for the formation of stable HIF heterodimers. We localized HIF-1α and HIF-2α mRNA expression by in situ hybridization and found a similar pattern for each transcript. Previously, in situ hybridization of adult mouse kidney showed glomerular expression of HIF-2α, but cellular definition was not resolvable with the 33P-labeled riboprobe technique used (40). HIF-2α was originally described as an endothelial-specific transcription factor (40) but subsequent studies have shown expression in non-endothelial cells in culture (44). Our results further confirm that HIF-2α is expressed by non-endothelial cell types in vivo, including glomerular and tubular epithelium and mesenchymal cells of developing kidneys. Although posttranslational modifications are largely responsible for regulating HIF-α availability and function in hypoxic cells (6), strong evidence exists for HIF-1α mRNA induction in response to hypoxia (45–47 ⇓ ⇓). We observed intense antisense hybridization signals for HIF-1α and HIF-2α in the medulla, particularly in the collecting duct epithelium, which is a site of VEGF secretion. Oxygen tensions are exceedingly low in the mature renal medulla (10 to 20 mmHg) (48–50 ⇓ ⇓), which is also consistent with our data showing prominent Hypoxyprobe-1 labeling in this region of the kidney (discussed further below). These observations suggest that hypoxia in the developing medulla is associated with HIF-1α and HIF-2α transcription. In addition to the medulla, the developing renal cortex showed intense antisense hybridization signals for HIF-1α and HIF-2α, and, in developing glomeruli, podocytes showed particularly high levels of these mRNAs. Immunohistochemical analysis of HIF-1α protein in mature mouse kidney has shown normoxic expression in distal convoluted tubules (41), whereas another study has demonstrated HIF-1α and HIF-2α expression in mature rat kidney only after hypoxic stimulus (51). To determine which cell types in developing mouse kidney contained HIF-2, we looked for overlapping protein expression patterns for HIF-1β and HIF-2α by immunohistochemistry. HIF-1β protein stability is not dependent on oxygen concentration, and this HIF subunit is constitutively found in the nucleus of most cell types, which is consistent with the widespread nuclear staining observed in our experiments. All tubular segments and glomerular podocytes were positive for HIF-1β. HIF-2α protein, however, displayed a much more restricted expression pattern. Nuclear HIF-2α staining was observed in developing nephrons of the outer cortex, a distribution that is consistent with that for HIF-2α mRNA. Nuclei in developing podocytes of immature nephrons were intensely positive for HIF-2α, making HIF-2 a candidate regulator of VEGF transcription and glomerular capillary development. Whether hypoxia or other conditions are chiefly responsible for HIF stabilization in developing glomeruli is unclear, however. Our Hypoxyprobe-1 immunofluorescence experiments showed only weak labeling in regions of the outer cortex that contained nuclear HIF-2α protein, suggesting that factors other than hypoxia may promote HIF-2α stabilization in these cells. On the other hand, Hypoxyprobe-1 forms protein adducts only in severely hypoxic cells (with half-maximal labeling of cells at O2 concentrations as low as 0.1 to 0.3%) (52), whereas HIF-α protein stabilization occurs at oxygen concentrations well above the Hypoxyprobe-1 binding range (53). Therefore, relatively mild hypoxia might contribute to sufficient HIF heterodimer formation that could be physiologically important for activation of VEGF and other hypoxia-responsive genes. Alternatively, cortical HIF induction might be regulated by factors unrelated to hypoxia. Candidates for hypoxia-independent activation of HIF include insulin, IGF-1, nitric oxide, IL-1β, and TNF-α. Insulin has recently been shown to induce HIF-1α protein accumulation, binding of HIF-1 to DNA, and reporter gene expression in cultured human retinal epithelial cells through a PI3K/TOR–dependent pathway (54). Insulin-induced HIF-1 activity in these cells results in increased VEGF transcription. After cardiac arrest and resuscitation in rats, HIF-1α expression in cerebral cortex persists beyond reoxygenation and is accompanied by an increase in insulin-like growth factor (IGF-1) (55). IGF-1 induces HIF-1α expression in neurons in vitro and in vivo in rats receiving IGF-1 infusion. Additionally, nitric oxide has been shown to stimulate HIF-1α accumulation (56) and the cytokines interleukin-1β (IL-1β) and tumor necrosis factor α (TNF-α) also induce HIF activity (57). Any or all of these factors may operate synergistically with mild hypoxia to activate HIF in the developing kidney cortex, but these possibilities require further investigation. In addition to developing glomeruli, many developing tubules were also immunoreactive for HIF-2α, with staining observed in nuclei as well as cytoplasm. We believe that the cytoplasmic distribution might represent HIF-2α protein degradation by proteasomes. Unlike glomeruli, several developing and mature tubular segments were strongly positive for Hypoxyprobe-1, suggesting that hypoxia may indeed induce HIF-2α stabilization in these cells. Angiopoietin-2 is expressed in developing tubules (37) and might therefore be regulated by the extreme hypoxia and HIF localization observed here. Our metanephric organ culture experiments showed that HIF-1α and HIF-2α proteins and VEGF mRNA were all expressed in cultures maintained at 20% oxygen. However, exposing kidney explants to 5% oxygen for 5 d or 2% oxygen for 6 h caused increases in HIF protein and VEGF mRNA expression. Nevertheless, the presence of HIF-α proteins in metanephroi maintained at 20% oxygen again strongly suggests that hypoxia-independent mechanisms can induce stabilization of these proteins in kidneys. Previous studies have shown that vascular smooth muscle cells contain stabilized HIF-1α protein when cultured in serum at normoxia, but stabilized proteins are degraded upon serum removal (58). Because kidneys in our experiments were also cultured in serum, perhaps serum stimulated HIF-α protein stabilization through a hypoxia-independent mechanism. Regardless, our organ culture results also showed that hypoxia strongly induced HIF-α protein and VEGF expression in kidneys in vitro. Together with our HIF immunolocalization findings on kidney sections, we believe that both hypoxia-dependent and hypoxia-independent mechanisms are probably operative in vivo. On the basis of data presented here, we propose that metanephric vasculogenesis may be initiated, in part, by HIF-1 and HIF-2 induced gene expression. Physiologically important amounts of HIF protein may be stabilized by severe or mild hypoxia and/or by other mechanisms. By whatever means, upregulated HIF-1α and HIF-2α protein stability could stimulate production of VEGF and other HIF-inducible gene products. HIF stabilization specifically in immature podocytes might therefore represent a critical initial signal for the inception of glomerular capillary morphogenesis, and we are currently testing this hypothesis. We thank Rosetta Barkley and Eileen Roach for technical assistance. Funds came from National Institutes of Health grants DK34972 and DK52483 (DRA) and the American Heart Association (BR). Altered Gene Expression Related to Glomerulogenesis and Podocyte Structure in Early Diabetic Nephropathy of db/db Mice and Its Restoration by Pioglitazone.